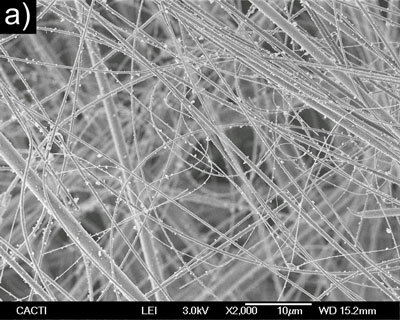 (Nanowerk News) A team of researchers from the University of Vigo, Rutgers University in the United States and Imperial College London, in the United Kingdom, has developed "laser spinning", a novel method of producing glass nanofibres with materials. They have been able to manufacture bioglass nanofibres, the bioactive glass used in regenerating bone, for the first time. "Laser spinning makes it possible to produce glass nanofibres of compositions that would be impossible to obtain using other methods", Félix Quintero, co-author of the study ("Laser Spinning of Bioactive Glass Nanofibers") and a researcher at the University of Vigo, tells SINC. The new technique, which was highlighted on the front cover of the journal Advanced Functional Material, involves using a high-energy laser that melts a small amount of precursor material. This creates a super-fine filament that is lengthened and cooled by a powerful gas current. This international team has managed to produce bioglass composition nanofibres, a bioactive glass that is used to regenerate bony tissue. The laser spinning makes the material flexible, continuous and gives it a nanometric structure, which helps in the proliferation and spread of bone cells. Aside from the scientists from the University of Vigo, a research group from Rutgers University in the United States and another from Imperial College London, in the United Kingdom, also took part in this initiative.